In the recent past, I had a talk with one of my friends. He is working in a knitwear manufacturing company as project head. We were casually discussing the different issues faced by industrial engineering department and production team in completing the orders on time. The common challenges of the apparel manufacturing business - lead time and manufacturing cost. And we are discussing the future possibilities of improvement in these areas. I was inquiring about their shop floor performance and what they used to do to maintain the benchmark performance. What the expectation of their management from them. From the discussion, I come to know some very interesting facts that are a remarkable performance in the garment manufacturing industry. To be true, I have never heard of such kind of performance a garment unit may have. Especially in the Indian garment factories I have never seen or heard about such kind of performance and improvement they have done in the recent times. I have listed down some of their record breaking performance in following pointers. Style change over time is near to zero: Their production lines do not waste time in the style changeover process (line setup). Though they manufacture a staple product, their product includes a variety of designs and they need to set the line for new styles. Relocation of manpower and machines are done. To maintain the style change over time minimum, they train their operators in advance in the training area before they put operators on the production line. Most of the operators earn a lot of incentives (Money): They give performance incentive to their workers. Under the performance incentive scheme, their employees earn good amount of incentives. This is one of the primary reasons for being competitive. Their employees undergo a training program before working on the shop floor. In case an operator is given a new operation in which she has no prior skill, she just says ‘no’. The reason she would be earning good incentives in the new operation. Operators demand skill training on that specific job (operation). Factory efficiency 100% plus (on GSD standards): Often they reach above the 100% line efficiency. The individual operator efficiency comes more than 100%. In that factory reduction of two seconds from an operation cycle time counted as an improvement. Innovation team - This team works on a new and innovative way to improve methods and reduce the production cost in the coming years. Even two seconds reduction in the cycle time of an operation is considered and cost saving in the long run. Kaizen team – They encourage employees to think about doing the work in a better way. Manage and evaluate Kaizen project. Organize Kaizen event and best performers are awarded. Operator Training cell – Factory has an independent cell for training fresh and low skilled operator. Even skilled operator get training on method improvement and doing a new kind of operations. There is no limit of improvement in the garment shop floor. One should not be satisfied with 60% line efficiency (month average). 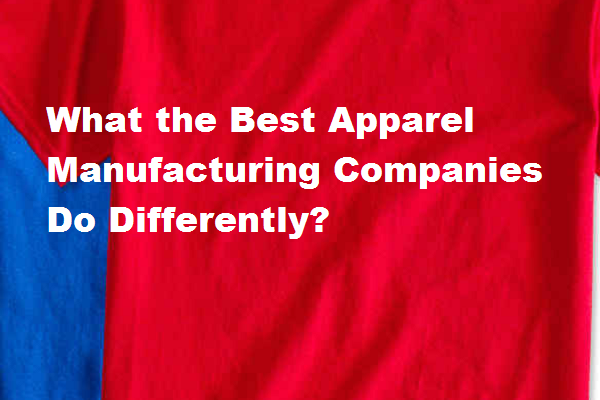 Do you know what should be the benchmark performance of an apparel manufacturing company? Do you have any goal on your factory performance, in terms of efficiency or production cost in each year? Are you happy with that? I have listed down above points that might inspire you to bring such improvement in your organization. Online Clothing Study: What the Best Apparel Manufacturing Companies Do Differently? Improvement projects in garment manufacturing shop floor by industrial engineering team.